Our values are interwoven in every part of our organization and are rooted in honesty, respect for one another, support of family and community, and hard work. They can never be compromised in fulfilling our purpose and mission. To deliver painting services with a focus on speed, style, value, and a level of service excellence and perfection that literally astounds our customers. "Welcome, to Creative Man Painting, we have been locally owned and operated since 1995. Creative Man Painting has satisfied hundreds of Scottsdale and the Phoenix metropolitan area including mesa, peoria, phoenix, fountain hills, carefree, cavecreek, paradise valley ... homeowners with our professional workmanship and our selective skillful staff. We take pride with every client to present them with all information about our company and our painting skills to beautify your next home. We are fully qualified to handle any project, large or small. Our crews are experienced, professional, energetic, and courteous. With over 15 years of experience, we know that honesty in business and a job well done make for happy customers. We deliver unbeatable service and workmanship on every project. Preparation is 75% of a job. We are committed to getting the job done right the first time. Our professionalism and courteous conduct are demonstrated by the care given to you and your home. From the moment we enter your home until the time we leave, you will receive worry-free, quality products and service, from a professional painting company. Our attention to detail and work habits, coupled with high integrity, makes doing business with Creative Man Painting as easy as can be, whether your project is for a single room or your entire house. Creative Man Painting carries full liability, and Workers Compensation Insurance for your peace of mind and protection of your home. You can easily check license and insurance information on Creative Man Painting and any other other licensed contractor though the Arizona licensed contractors website. . MANY "contractors" do not carry workers compensation insurance which leaves you open to lawsuits in the event a worker is injured on your property. "Building custom look's and design's for your decorating taste"
To be a dynamic organization of highly productive and creative employees who strive together as a team to deliver extraordinary painting services, Faux Finishes, Murals, Venetian Plaster, Re-Finishing Furniture, Artistic Work, and of service and value to our customers. 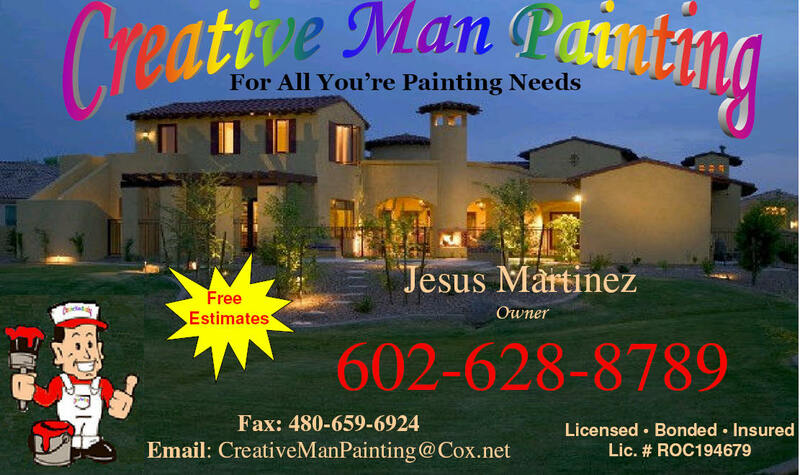 Creative Man Painting is the #1 choice for Painters in Scottsdale. We are Licensed, Bonded and Insured with over 20 years experience.